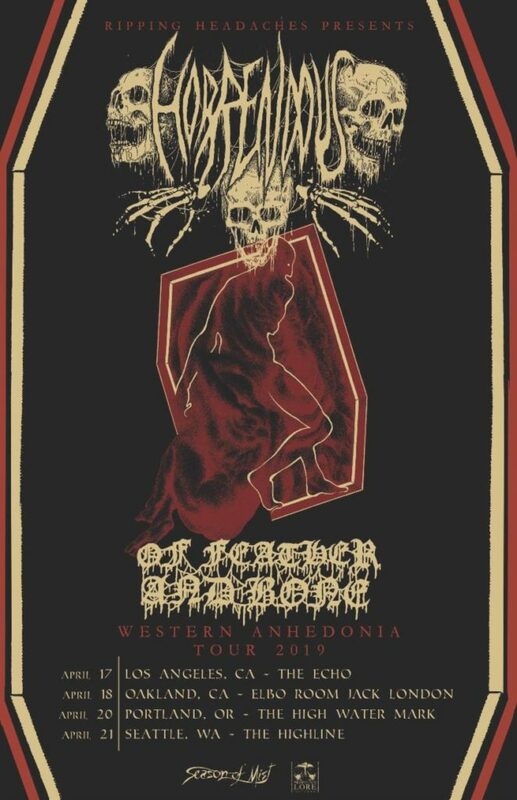 Philadelphia/Washington, DC-based forward-thinking death metal behemoths HORRENDOUS will join Denver death metal trio Of Feather And Bone for the Western Anhedonia Tour 2019. Set to commence on April 17th, the four-date journey will make its way through Los Angeles, Oakland, Portland, and Seattle. The tour follows HORRRENDOUS‘ performance at Adroit Theory’s Dawn Of A Dark Day in Purcellville, Virginia this weekend with Outer Heaven and Foehammer and serves as a precursor to their set at Graveland Fest in Hollandscheveld, The Netherlands in May marking the band’s first-ever European show. HORRENDOUS will be touring in support of their Idol full-length, released late last year via Season Of Mist Records. Drawing inspiration from both personal and national crises, Idol‘s music is a methodical and unapologetic take on dynamic, progressive death metal. The album sees HORRENDOUS at the highest echelon of their musical creativity to date. Thematically, Idol is an exploration of defeat; of the gods we build in our minds to escape the responsibility of action and change as we relinquish our agency. Idol‘s music mimics this act of deity building, with sprawling compositions that are imposing in scope and mirror the great turmoil of our times. Tracks like “Soothsayer,” “Golgothan Tongues,” and the monumental “Obolus” position the band in a league of their own, as one of the death metal’s leading new entities. ← Previous post:INCANTATION: Announce Siege of the Profane European Spring Headline Tour.